Framed photos of De La Salle Academy graduation exercises June 12th 1927. 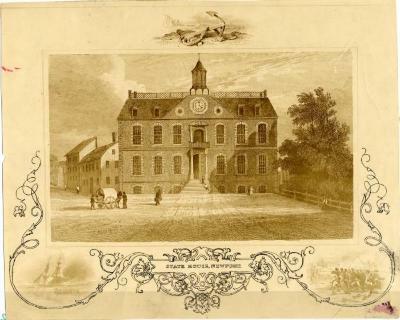 Photograph of a print drawn by G. Wall: "State House, Newport" with small prints below-"Burning Of The Gaspee", "Sullivan's Retreat". Black and White photograph of four members of Newport Artillry Company. George W.F. Rodda second from right. 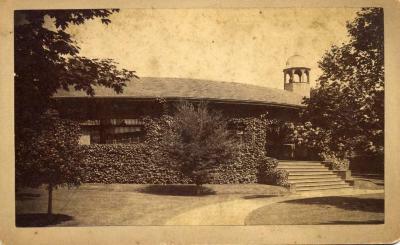 Photographic Postcard. 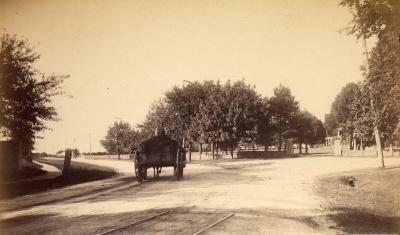 Black and White photograph of Newport Artillery Company stranding in grass along dirt road. 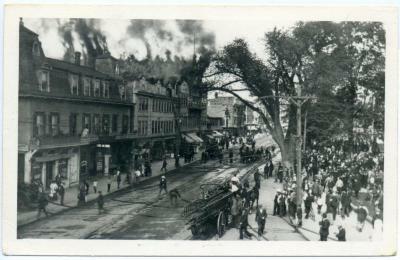 Photographic postcard. Black and white photo of Newport Artillery Company in from of Artillery Company Building. George W.F. Rodda in back row, second from right under door light. Photo mounted on cardboard. 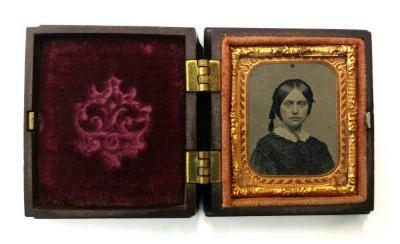 Photograph (Daguerreotype?) of a woman. Gold matting, red velvet trim. Flowers imprinted on the leather case. Dagerreotype? of a man. God matting, red velvet trim. Half of brown leather case. Imprinted floral design on leather case. 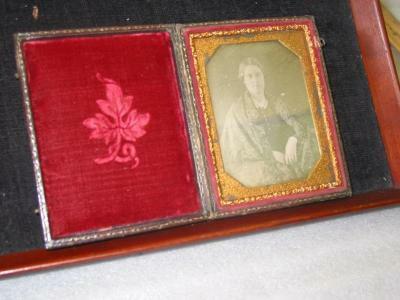 Dagerreotype? of a woman. Gold matting, velvet trim, half of brown leather case. Imprinted design on leather case. Small brown wooden box with an elaborate design - a bee hive in the center. Inside is a red velvet lining with a design. Opposite side is a young woman's portrait wth a gold colored border. 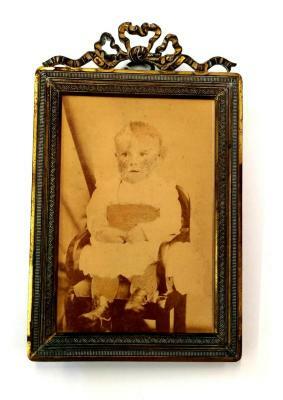 Photograph of a seated baby. 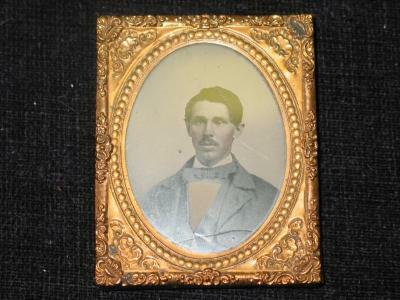 Gold colored frame with a stand. Gold metal bow at the top of the frame. 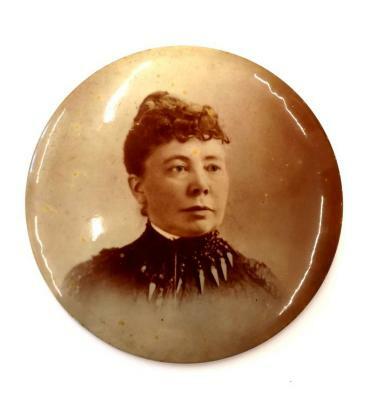 Large "button" shaped circular photograph mounted on a circular shaped piece of metal. Portrait of a woman wearing a beaded neck piece. 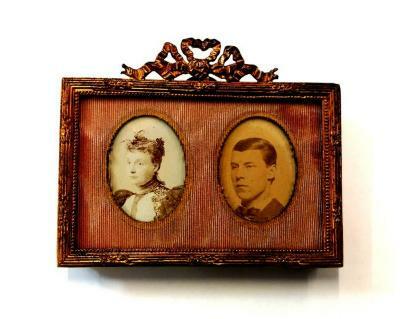 Gold-colored frame with a portrait of a female (left) and a portrait of a male (right). Light pink fabric matte. Photo on metal image of a man with words across bottom. Gold colored frame, decorated. 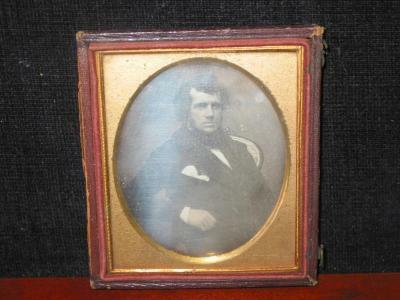 Image of a man, back is stamped "Daguereotypes, Ambrotypes and Photographs by L.B. Howard. Broken piece of white glass with an image of the Bishop Whitehouse. Color photograph of George Way Swinburne. Dark wood frame, gold trim and gold name plate at the bottom. Black and white photograph of an older woman wearing a bonnet, sitting in a rocking chair, and sewing. She is seated next to a fire place. 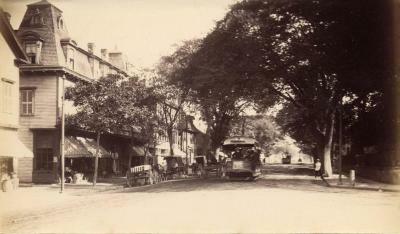 Broadway, looking north from Bull Street. Electric street car in front of city hall. Green End Bridge, Honyman Hill, Middletown. Earthworks of Green End Fort in foreground. 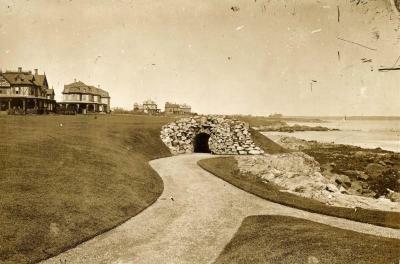 Cliff Walk tunnel, near Rough Point, looking north. 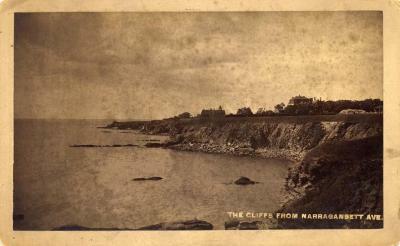 "RockCliff" and "Ocean View" on left. 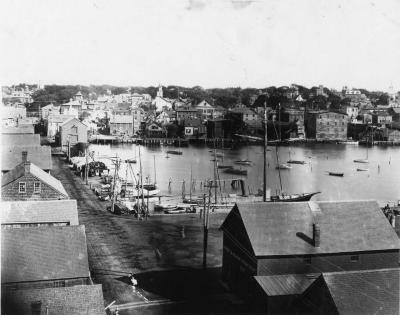 Harbor and Long Wharf, looking east. 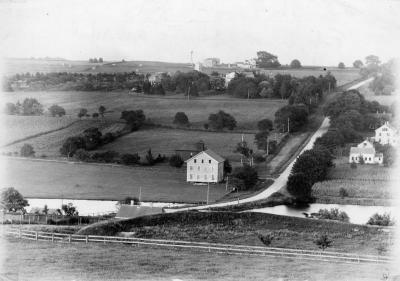 One Mile Corner, looking north.